The Sound of Thunder is the official expander for the Tyme Sefari Mark II. It features a bank of switch and gate controls to enable additional operating modes, as well as additional I/O for stereo operation. Extra modes include pitch shift, audio format control, and four circuit bent modes. 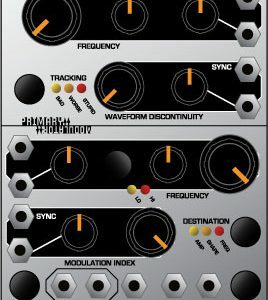 Four new modes are available on this expander, represented by eight toggle switches and gate inputs. 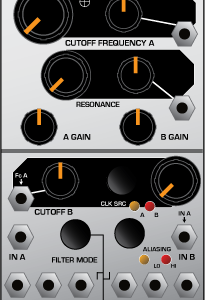 To enable each, flip the associated switches up, or insert a 5V gate signal into the input. 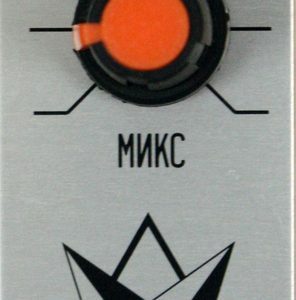 The new addition of the gate jacks allow full remote control of the Tyme Sefari‘s recording mode, allowing unique rhythmic effects and controllable corruption of the sampled audio signal. The first two switches control the format of audio that the Tyme Sefari records to its internal memory. Four choices are available, represented by a combination of the two switch settings and explained by a graphical key on the front panel. The four choices are 16-bit linear, 12-bit linear, 12-bit logarithmic, and 8 bit linear. The 16-bit mode is the default under which an unexpanded Tyme Sefari operates. The 12-bit linear is of slightly lower quality. The next two modes double the available recording time due to their decreased consumption of memory. The 12-bit logarithmic mode compresses the signal into a single byte, using a scheme originally designed for 1970s-era digital telephony. The 8-bit mode is the fuzziest of the bunch and the most straightforward, mimicking the behavior of the classic “mark I” Tyme Sefari. This switch enables a crude pitch shift effect. It directs the playback head to run at a different speed than the record head, controllable by the large frequency knob and CV input. This will occasionally cause glitch effects as new data being recorded overruns the playback of old audio. By turning up the feedback, one may achieve bizarre, frequency-staircase “crystallizer” effects, causing the pitch of the delayed audio signal to endlessly travel in one direction. The pitch shift control changes the playback speed of the audio to one octave above or below that of the original recording, with the distortions present in the sampling rate mismatch contributing to the unique character of this effect. Remove your Tyme Sefari from the rack and view the two 10-pin headers named “THUNDER” and “THUNDER2“. Connect the two ribbon cables from the SOUND OF THUNDER to these headers, making sure the red bands point down. 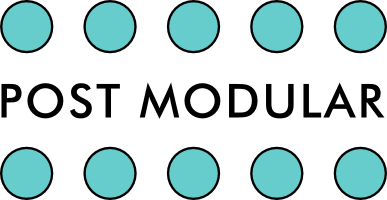 Install both module and expander into the rack. The SOUND OF THUNDER adds several optional modes to the Tyme Sefari, activated through 8 sets of toggle switches and gate inputs. Like the Tyme Sefari, the parameter is active if the switch OR the gate input is high. The gate inputs are provided to automate control of this module’s deep functions, and to present further sound design possibilities. For example, the stereo and format controls change the way that audio data is encoded AND decoded from memory, but the data in memory is not tagged with its proper format description. If you record in one format, but then play back in another, new, extreme distortion effects may be heard depending on the combination of modes used for recording and playback. – 12-bit linear. This is stored into memory with the bytes swapped, and restored to normal when played back. – 12-bit logarithmic (Ã‚Âµlaw) – This setting doubles the amount of memory available for recording, and slightly increases the maximum sampling rate. – 8-bit linear – This setting doubles the amount of memory available for recording, and slightly increases the maximum sampling rate. This mode changes the behavior of the SAMPLING RATE control. When active, the rate of recording is fixed. The playback rate is variable, with the center position of the large knob meaning that there is no pitch shift. Turning the knob counter-clockwise results in a downward pitch shift, and turning it clockwise results in an upward pitch shift. Try this in “delay” mode with lots of feedback for some interesting harmonic staircase effects. This group of four switches will interfere with the address and data busses of the TYME SEFARI MARK II. Effects similar to a “circuit bent” toy keyboard will be heard as these switches perform identical functions. All 8 features have manual switches and gate inputs.